While overuse has played a part, a significant portion of the reservoir decline is due to an ongoing drought , which started in 2000 and has led to substantial reductions in river flows. Most droughts are caused by a lack of precipitation. However, our published research shows that about one-third of the flow decline was likely due to higher temperatures in the Colorado River’s Upper Basin, which result from climate change. This distinction matters because climate change is causing long-term warming that will continue for centuries. As the current “hot drought” shows, climate change-induced warming has the potential to make all droughts more serious , turning what would have been modest droughts into severe ones, and severe ones into unprecedented ones. High temperatures affect river levels in many ways. Coupled with earlier snow melt, they lead to a longer growing season, which means more days of water demand from plants. Higher temperatures also increase daily plant water use and evaporation from water bodies and soils. In sum, as it warms, the atmosphere draws more water , up to 4 percent more per degree Fahrenheit from all available sources, so less water flows into the river. These findings also apply to all semi-arid rivers in the American Southwest, especially the Rio Grande . Knowing the relationship between warming and river flow, we can project how the Colorado will be affected by future climate change. Temperature projections from climate models are robust scientific findings based on well-tested physics . 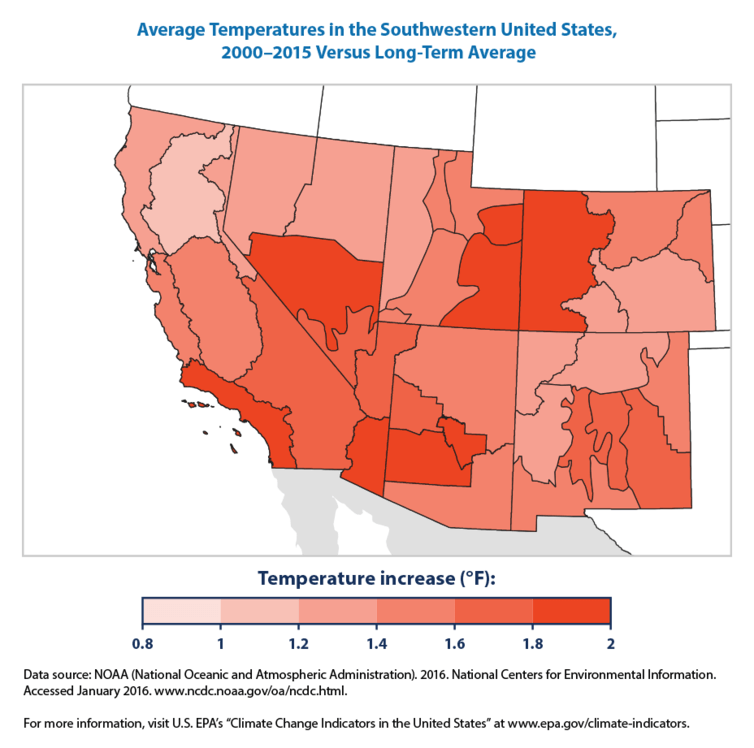 In the Colorado River Basin, temperatures are projected to warm by 5°F, compared to the 20th-century average, by midcentury in scenarios that assume either modest or high greenhouse gas emissions. By the end of this century, the region would be 9.5°F warmer if global greenhouse gas emissions are not reduced. Using simple but strong relationships derived from hydrology models, which were buttressed by observations, we and our colleagues calculated how river flows are affected by higher temperatures. We found that Colorado River flows decline by about 4 percent per degree Fahrenheit increase , which is roughly the same amount as the increased atmospheric water vapor holding capacity discussed above. Thus, warming could reduce water flow in the Colorado by 20 percent or more below the 20th-century average by midcentury, and by as much as 40 percent by the end of the century. Emission reductions could ease the magnitude of warming by 2100 from 9.5°F to 6.5°F, which would reduce river flow by approximately 25 percent. On a year-in, year-out basis, these large increases would be substantial. The largest decade-long increases in precipitation in the 20th century were 8 percent. When such an increase occurred over 10 years in the Colorado Basin in the 1980s, it caused large-scale flooding that threatened the structural stability of Glen Canyon Dam , due to a spillway failure not unlike the recent collapse at California’s Oroville Dam . For several reasons, we think these large precipitation increases will not occur. The Colorado River Basin and other areas around the globe at essentially the same latitudes , such as the Mediterranean region and areas of Chile, South Africa and Australia, are especially at risk for drying because they lie immediately poleward of the planet’s major deserts. These deserts are projected to stretch polewards as the climate warms. In the Colorado River basin, dry areas to the south are expected to encroach on some of the basin’s most productive snow and runoff areas. Megadroughts , which last anywhere from 20 to 50 years or more, provide yet another reason to avoid putting too much faith in precipitation increases. We know from tree-ring studies going back to A.D. 800 that megadroughts have occurred previously in the basin. Several new studies indicate that with warmer temperatures, the likelihood of megadroughts skyrockets in the 21st century, to a point where the odds of one occurring are better than 80 percent . So while we might have periods with average or above-average precipitation, it also seems likely that we will have decades with less flow than normal . March of 2017 was the warmest March in Colorado history, with temperatures a stunning 8.8°F above normal . Snowpack and expected runoff declined substantially in the face of this record warmth. Clearly, climate change in the Colorado River Basin is here, it is serious and it requires multiple responses. It takes years to implement new water agreements, so states, cities and major water users should start to plan now for significant temperature-induced flow declines. With the Southwest’s ample renewable energy resources and low costs for producing solar power , we can also lead the way in reducing greenhouse gas emissions, inducing other regions to do the same. Failing to act on climate change means accepting the very high risk that the Colorado River Basin will continue to dry up into the future.